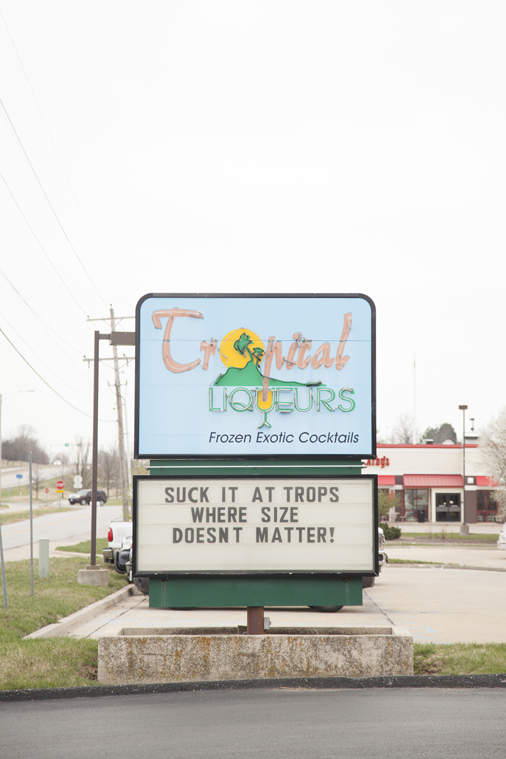 The Trops South sign quite often features cheeky quotes. Twenty-nine years ago, Ira and Mary Dodds, owners of a construction company, took a trip down to Louisiana, a location famous for the love of adult beverages, especially the daiquiri. The Dodds’, already entrepreneurs, quickly realized what Columbia, MO was missing: a daiquiri-focused bar. 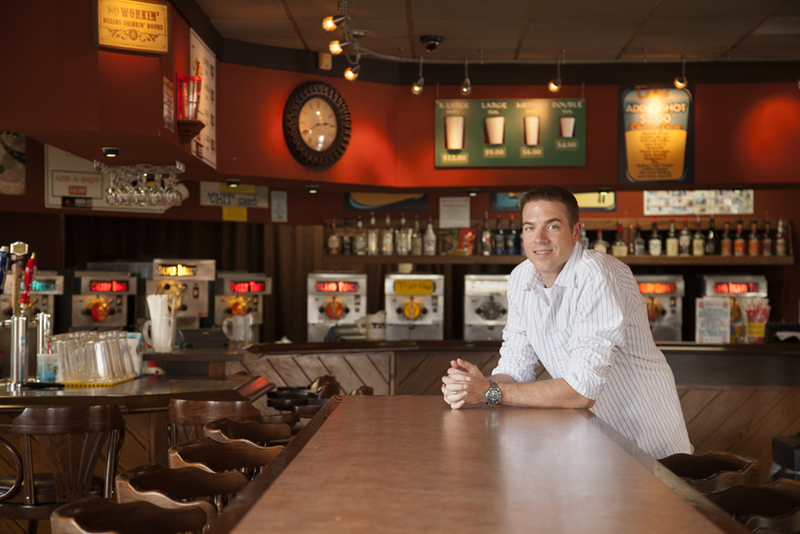 “I’m sure the idea of owning a bar didn’t hurt their decision,” laughs Alan Dodds, current Trops owner and son of Trops founders. What followed was the creation of the staple of the Columbia bar scene: Tropical Liqueurs. Tropical Liqueurs opened in 1985 on 7th street, in downtown Columbia, home of the current Snapper’s. In 1990, the 515 E. Broadway property opened up offering more indoor space AND patio space, and has resided there ever since. What started as a downtown staple Tropical Liqueurs has since spread to a second spot in South Columbia and a third in Springfield, MO. Like so many other children of business owners, Alan’s experience with the family business started at the bottom, working his way up. He started as a waiter, later graduated to bartending. “After about 10 years of waiting tables and bartending,” says Alan, “I had enough.” Eventually, Alan began working behind the scenes. Upon opening the second and third Trops locations, Alan couldn’t be everywhere at once and took on the role of “boss”. “Now I spend my time in the office in front of my computer and on the phone, just like everyone else,” confesses Alan. While Alan may have gone from bartending to a desk job, owning such a cool string of bars does have its perks here and there. 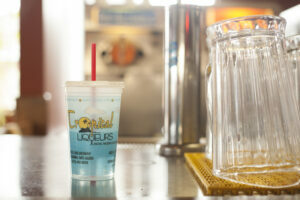 Trops now has 50+ tasty beverage recipes under its belt. What originally began as simple, cold beverages consisting of ice, rum, a teaspoon of sugar and fresh squeezed lime juice has evolved into a seemingly endless list of sweet, tart or tangy drink variations. When Tropical Liqueurs first opened all of the daiquiri recipes were original and created in house. 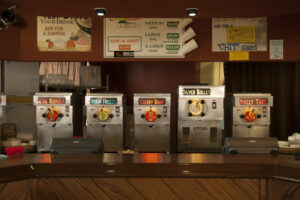 Over the years, each location has grown to at least 15 drink machines and the recipe count is now over 50 concoctions. 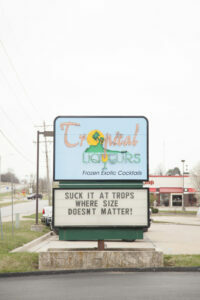 The list continues to grow as Trops adds at least one new daiquiri flavor a year. Sadly, Alan was not ready to divulge this year’s upcoming addition. However, Alan did mention a new thing for Trops: lovers of the frosty beverages can now relax and enjoy Trops seven days a week as all three locations are now open Sundays from noon until midnight. At one point in time, Trops offered a small menu consisting of bar-style food. The South Columbia location used to have a full kitchen, however it was shut down in 2009. “The food was good,” explains Alan. “People liked it. It just wasn’t a draw.” With 40+ restaurants in the area Trops decided to pull out of the competition. What may not be a perk of bar-ownership is one of the most typical issues bars have: fake IDs. Tropical Liqueurs, is very strict about selling alcohol to those underage, as every bar should be. Alan has created a method to keep his staff’s keen eye out for fakes. “We pay everyone $5 for every fake ID they keep.” What do they do with all the fakes? Check out the wall behind above the daiquiri machines at the South Columbia Location. With the Columbia and Springfield locations running like well-oiled daiquiri machines, what’s next for Trops? Alan met Monica Pitts, Creative Director of MayeCreate Design, in 2007, through mutual friends. MayeCreate may have been in its toddler years, but the work they were putting out spoke for itself and Trops knew MayeCreate could deliver. The beach-themed Tropical Liqueurs website. Alan came to MayeCreate table with a simple goal: make Tropical Liqueurs information easily accessible. “With three different locations,” explains Alan, “and the way I saw technology going with people and smart phones, we wanted to share our menus, locations and how to get here.” Tropical Liqueurs was in need of a website. MayeCreate took this direction and created a beach-themed, calming, relaxed website with easy to use navigation. The 2trops.com navigation, illustrated with little wooden beach signs, clearly directs viewers to whatever information they are seeking. Visitors are welcome to peruse the Trops menu and specials and easily find contact and location information. Enjoy your tasty beverage in a Tropical Liqueurs cup. Recently Alan had MayeCreate add a shopping cart to the website. By visiting the Merch page, Trops fans can purchase gift certificates, branded plastic cups and tumblers illustrating the popular white cup, red straw drinks Trops is famous for. When asked if Alan has been pleased with MayeCreate, his response was priceless. MayeCreate’s ultimate goal is to please their clients, and just like daiquiris, they’re delightful, sweet and sometimes a little tangy.